I promised a new rec and I have it. 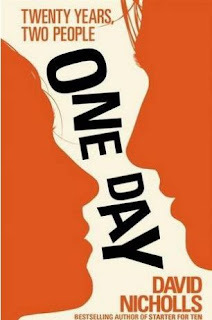 One Day by David Nicholls is the perfect summer read. Maybe not for those who bass fish or have chest hair, but definitely for the rest of us. We catch up with Emma and Dexter on the same day every year for 2 decades. It's a journey through the years filled with humor, romance and great writing. My youngest godson now insists you call him "Luigi." A child at my work camp last week carried a Luigi doll everywhere. The toy had goggles for the pool. Mario Brothers is all-powerful. Singer songwriter time. I first heard Matt Wertz on tour with Dave Barnes and I was sold. This is my favorite song "I Will Not Take My Love Away." Might I also suggest "Carolina" and "Sing My Lonesome Away?" I love me some Matt Wertz. Have you nabbed his free live album?